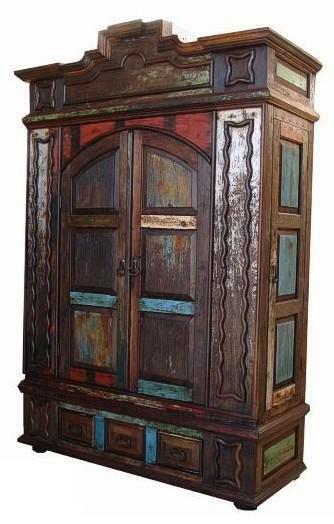 Our gorgeous Designer Armoire features reclaimed wood accents and beautiful polychromed wood. One of the challenges in Mexican architecture is that closets are not plentiful. In restored colonials in Merida, Yucatan, for example, architects opt for space rather than, say, walk-in closets. We totally get it. But, one still needs a way to organize shoes, clothes, even linens. This unique armoire has two doors at the front and one door on each side, making it a very functional piece of furniture -- add our designer series finish ... and this will look beautiful in any room. We love the limitless possibilities in this armoire -- actually it reminds us of the magical wardrobe in the Narnia series. We have seen it paired with the Hacienda bed and the Indian bed and the result is spectacular!